Harry Bates and John McCarthy claimed bragging rights at The Bend Motorsport Park, posting the fastest time in both Super Special Stages to hold a slim 1.3 second lead at the BOTT Adelaide Hills Rally. 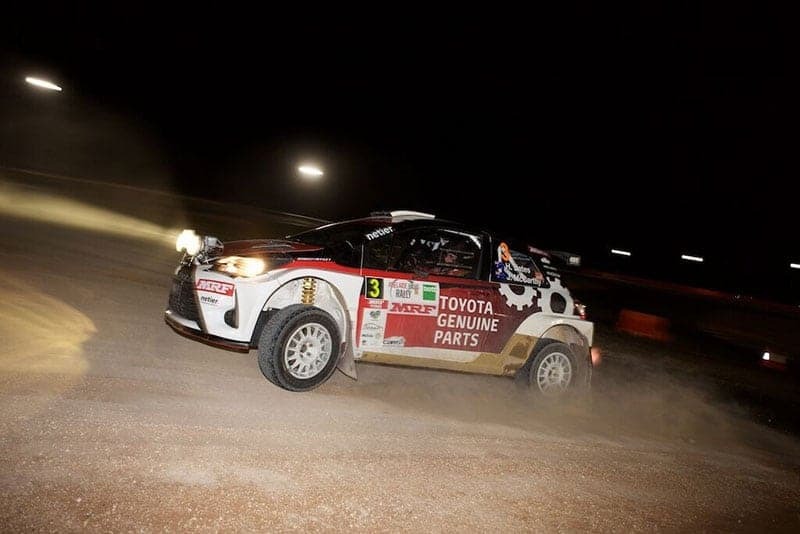 Fans enjoyed side-by-side rally action at round five of the CAMS Australian Rally Championship (ARC) on Friday night as competitors completed two 1.7 kilometre match races under lights on the brand new Stadium circuit. Bates’ Yaris AP4 had the edge over Eli Evans and Ben Searcy in the Skoda Fabia R5 on both stages, the rivals going head to head on SSS1 – Bates the victor by 1.2 seconds. Chris Higgs and Daymon Nicoli celebrated their return to the ARC after more than 12 months absence by posting the third fastest time on SSS1, the top five rounded out by Declan Dwyer in the Mitsubishi Lancer EVO VI and Lewis Bates in the Toyota Corolla S2000 finishing in a dead heat. SSS2 saw Dwyer third fastest, followed by Higgs and Bates. Championship contender Steve Glenney sits sixth outright in the Subaru Impreza WRX STi after SSS2 while Subaru do Motorsport’s Molly Taylor and Malcom Read are ninth. The BOTT Adelaide Hills Rally continues tomorrow, with rally crews leaving the Mount Barker Service Park just before 8am. The 43-strong field will complete six special stages to the south-east of Adelaide, covering 110 competitive kilometres. The rally action will continue on Sunday with nine special stages north-east of Adelaide, culminating with a a podium presentation at the Mount Barker Service Park on Sunday at 5:30pm.